Bella loves Bubba. She plays, follows, mimics and adores Bubba. All day long they play and sleep like the puppies they are. Bubba is the ultimate patient older boy. Great job Bubba! Check out how Bella sleeps next to Bubba! We are taking the bus back from dropping off the rental car. I used a bag for garbage and the rental guy said he'd hook me up next time because nobody keeps the cars clean. We went to the Foot Zone and saw Ginny. She loves Bella. Her dog Winston was great with Bella. They're about the same height. I'm on the 234 just in case I'm never seen from again. Just went through Houghton. Here are some awesome paintings by Luba. Two weeks ago Bubba came up lame. He couldn't move and would cry when he stood up. I took him to the Vet and Dr. Norton said that Bubba was healthy as a horse and if I didn't bring him in; he wouldn't know anything was wrong. After a day, he was moving but really sore so I gave him aspirin twice a day. After three days he was back to his annoying self; barking and bringing me socks, his leash, shoes, etc until we go walking. Today we went to the park and he was flying. Here's a photo. This is my garage! It is getting cleaned tomorrow and I just wanted everyone to see how un-organized it used to be! Also this is sent from my iPhone; which is cool as sh!t. 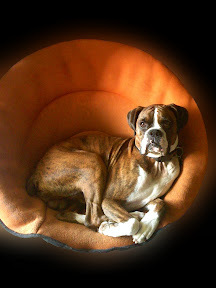 I am reducing auto-images to 240px (a little big) but it'll be cool when I take pictures of the baby boxer and post them here! The limitation is that you can only send 1 photo via the iPhone. I have to rename this photo because the iPhone always names it 'photo.jpg' and if I left it as that; the blog would only have one photo from my iPhone. So I rename and resize it! Because I am only retrieving emails every 5 minutes, the frequency at which you can post iPhone photos is one every 5 minutes or 12 per hour (for those math types out there!). So I called SWA and a very nice, polite gentleman helped me cancel my return flight; rare to see customer service. Then I booked a car with Avis to drive from Boise to Bellevue. This should be a nice 8+ hours for me and the new pup to get to know each other. And to put my smell on her, so Bubba will love her too! Just add your images using Picasa and then copy the "HTML to embed in website" box. I use the medium setting (288px). We are waiting to name the new puppy until after we get to know her. I pick her up next Sunday, March 2. In the mean time, we are referring to her as 'Fawnie'. Here are some 5 week old photos from her family in Idaho.